Guinness World Records Senior PR Manager Doug Male confirmed that they would not approve a record where local laws have been broken. “We take this matter very seriously,” he told Colombo Telegraph. 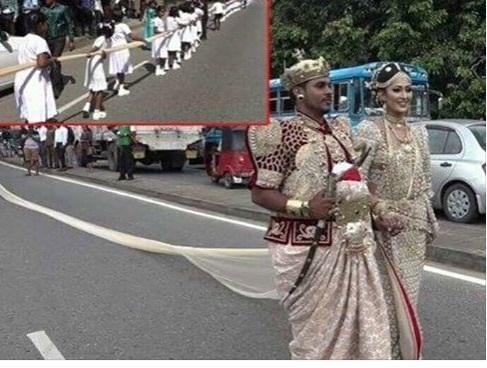 The wedding of Ruwan Pushpakumara and Sajini Priyangika Suraweera held on the 21st of September in Kandy received negative global publicity when they attempted to break an existing Guinness World Record for wearing the longest saree. In their quest to break the existing world record , 250 school children were forced to report to school at 2:30 am and line up the Gannoruwa – Kandy road in order to assist holding the 3.5 kilometer long saree, at setting a Guinness World Record. “We did receive an application, however I am unable to discuss the details of an application while it is still pending,” PR Manager Doug Male replied, when Colombo Telegraph queried if the record would be granted despite an ongoing child abuse case being investigated in its attempt. When Colombo Telegraph further queried if Guinness World Records officials were physically present at the world record attempt, Doug Male responded by saying “Guinness World Records was not present when the attempt was made. Approximately 80% of all official record attempts rely on evidence submission for verification. A very detailed and stringent pack of guidelines and evidence requirements, including independent witness statements, are issued to everybody who makes an application with us. Evidence is then reviewed by a team of experts and a decision is made”. Meanwhile Sri Lanka’s Central Province Governor Niluka Ekanayake ordered an investigation into child abuse be carried out after several complaints were received that the childrens’ lives were put in danger. « Are We Trailing Behind The Belt & Road?